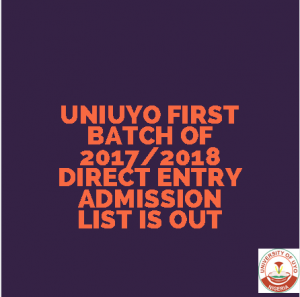 This is to bring to the notice of all Direct Entry candidates that the List of admitted candidates for 2017/2018 session has been released. pls I had applied for direct entry to study Quantity surveying with a 3.28 upper credit from Delta state polytechnic. what are my Chance’s to be admitted and do I need to process transcript???? Pls I put my reg no and was congratulated and also asked to print d admission status but I checked d jamb and so admission not yet offered. Pls what should I do? Please is there going to be a second batch? Please will thee be another list?